CHICAGO, March 22, 2013 (GLOBE NEWSWIRE) -- IOCOM, a leading worldwide provider of universal�video conferencing�solutions, announced they are actively recruiting highly regarded and motivated distribution and reselling partners to enhance their global presence. IOCOM's partner program is considered one of the strongest in the industry with significant margins and IOCOM's unique "No Cost to You" model. Tim Hackett, IOCOM CEO states "it's well known that hardware-based systems' sales are struggling in our industry and as a result, many channels are suffering from fewer deals that become more competitive. Many legacy vendors are stressing their partners with increasingly unreasonable demands, whether it is forcing them to accept shrinking margins or to pressure their customer for unnecessary and expensive maintenance contracts. We are finding our newer partners are extremely pleased with the low burden model we bring along with great products and support." Working with a wide range of technology providers, IOCOM combines its leading technology solutions to meet industry-specific requirements. IOCOM is focused on tailoring solutions across a wide range of industries, including healthcare, financial services, energy and utility, retail, hospitality, education, manufacturing, transportation, distribution and the public sector. "The IOCOM Partner Program puts customers first, by outfitting all of our channel partners with the right portfolio and support to shorten the sales cycle and immediately meet the demands of the market," said Dan Marchetto, Vice President of Business Development. "Our new initiative is raising the bar in the industry by simplifying processes and providing comprehensive training and tools to create new business opportunities for our partners. It's an incredible opportunity we are offering to our current and future partners as we've created an absolutely no cost partner program and removed all of the obstacles that impede a sales organizations ability to succeed. It allows our partners to do what they do best: deliver industry leading products to a client base that they have the strongest relationships with no hassles." 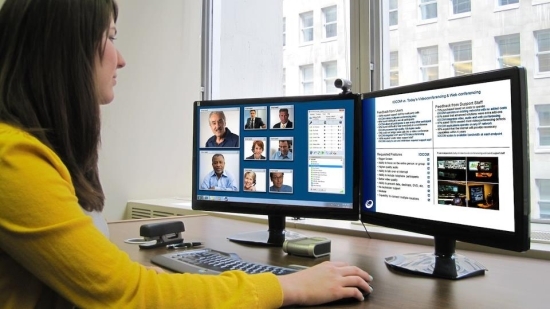 Well known for the intuitive user interface, Visimeet keeps people connected through video, audio, and data conferencing and gives users the ability to collaborate, transfer files, and share and view data in real time. Its solutions can connect with different and unlimited endpoints simultaneously, including room systems, desktop PCs, MAC's, notebooks, and mobile devices as well as telephone and H.323/SIP connections. Established in 1922, the Dukane Corporation is a diversified global manufacturer and marketer of advanced technology products. The Audio Video Products division is an industry icon specializing in sophisticated presentation solutions for businesses, governments, churches, and educational institutions across the country. Code3 AV is a full service audio and visual technology firm offering design and installation of audiovisual systems as well as integrated user control systems, equipment and technical support. They develop custom system packages that reflect the owner's functional, aesthetic and budget requirements. Founded in 1998 by Mr. Dhiren Shah & Mr. Anand Shah, RAHUL COMMERCE is a leading Apple Reseller and Service Centre providing Apple iPhones, iPads, laptops, Accessories.� They provide systems and products covering Animation, Motion Capture, Streaming, Special Effects, and Editing.� Some of the companies they represent are IOCOM, Apple, HP, Dell, Wacom, Viewcast, Vicon, Autodesk, Adobe, Toonboom, Massive, Vaddio, Real Networks, Quest 3d, Aspera and various Plug In's. Interested resellers can visit�http://www.iocom.com/about/partner.php�to learn more about the IOCOM Partner Program. CHICAGO, March 22, 2013 (GLOBE NEWSWIRE) -- IOCOM, a leading worldwide provider of universal�video conferencing�solutions, announced they are actively recruiting highly regarded and motivated distribution and reselling partners to enhance their global presence. IOCOM's partner program is considered one of the strongest in the industry with significant margins and IOCOM's unique \"No Cost to You\" model. Tim Hackett, IOCOM CEO states \"it's well known that hardware-based systems' sales are struggling in our industry and as a result, many channels are suffering from fewer deals that become more competitive. Many legacy vendors are stressing their partners with increasingly unreasonable demands, whether it is forcing them to accept shrinking margins or to pressure their customer for unnecessary and expensive maintenance contracts. We are finding our newer partners are extremely pleased with the low burden model we bring along with great products and support.\"
\"The IOCOM Partner Program puts customers first, by outfitting all of our channel partners with the right portfolio and support to shorten the sales cycle and immediately meet the demands of the market,\" said Dan Marchetto, Vice President of Business Development. \"Our new initiative is raising the bar in the industry by simplifying processes and providing comprehensive training and tools to create new business opportunities for our partners. It's an incredible opportunity we are offering to our current and future partners as we've created an absolutely no cost partner program and removed all of the obstacles that impede a sales organizations ability to succeed. It allows our partners to do what they do best: deliver industry leading products to a client base that they have the strongest relationships with no hassles.\"